FC Kansas City’s Caroline Kastor (23) makes a move against the Boston Breakers in this photo from July 9 in Allston, Massachusetts. Kastor played at Kansas University, sat out a year, then joined the Blues this season — just in time to win the National Women’s Soccer League championship. 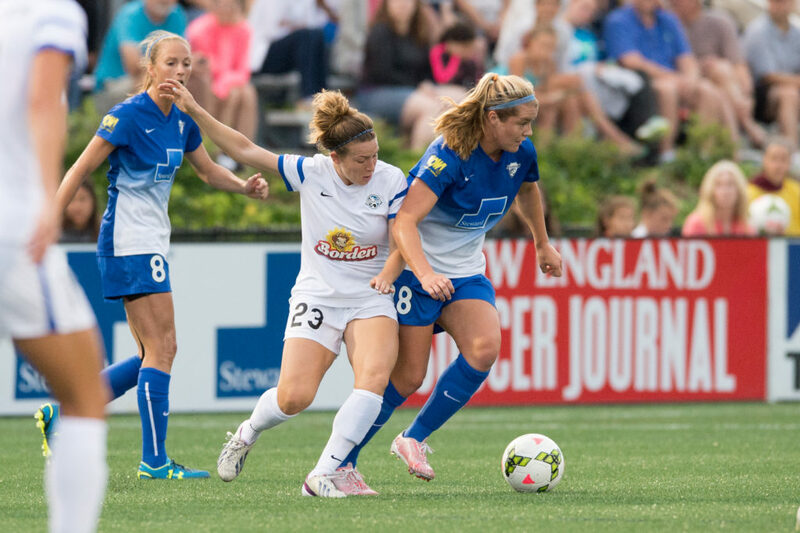 After helping FC Kansas City win its second straight National Women’s Soccer League championship Thursday against the Seattle Reign, former Kansas University forward Caroline Kastor has had time the past few days to reflect on her first professional season. Nothing came easy for Kastor in her rookie season. The former KU star — tied for second on Kansas’ all-time scoring list with 26 goals — was added to FCKC’s roster three games into the season as an amateur call-up and signed with the team on July 13. Kastor appeared in eight games and logged 161 minutes with the Blues, including one start against the Boston Barriers just four days before the team offered her a contract for the remainder of the season. The contract offer came as even more of a surprise to the 23-year-old because four United States women’s national team members — Becky Sauerbrunn, Amy Rodriguez, Heather O’Reilly and Lauren Holiday — were about to return to FCKC’s roster after the World Cup. Although the return of the four national-team members pushed Kastor further down the bench and out of the regular sub role she had earned, the time spent on the practice field with some the world’s best players greatly benefited the FCKC rookie. While it was Kastor’s first season as a professional, it was Holiday’s last; she officially retired after Thursday’s NWSL championship match. Gaining confidence was something Kastor said was crucial to starting her career at Kansas as well. Kastor scored three goals during her freshman campaign, but Kansas coach Mark Francis that there was a lot of room for growth in her remaining three years. Francis’ hunch was right. Kastor had a breakout junior season, with 11 goals, and racked up several Big 12 and national honors. “I’m thankful for the staff, academic staff, athletic staff and all of my teammates that helped me get to a point where I felt confident and started to delve into my potential as a player.” Kastor said. Kastor took a year off after completing her collegiate career at KU, but she did not show any rust while fighting for a spot on the FCKC roster. The Kansas alumna’s hard work on the practice and playing fields did not go unnoticed by FC Kansas City coach Vlatko Andonovski and his staff. Kastor’s contract expired at the end of the 2015 campaign, but Andonovski did not want to see her go.